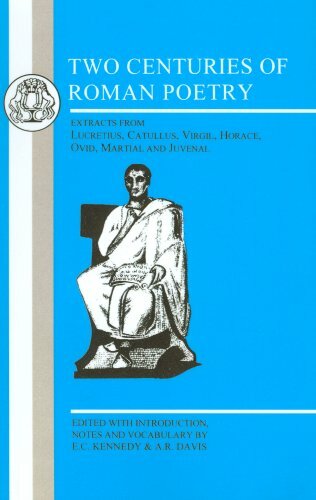 Two centuries of Roman poetry : extracts from Lucretius, Catullus, Virgil, Horace, Ovid, Martial, and Juvenal. Two Centuries of Roman Poetry was written by Aubrey Davis and Eberhard C. Kennedy. 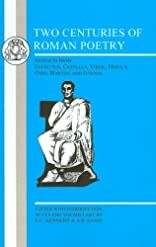 Two Centuries of Roman Poetry was published by St. Martin's Press. A subject of Two Centuries of Roman Poetry is Bargain Books. About Aubrey Davis (Author) : Aubrey Davis is a published author and a narrator of children's books. Some of the published credits of Aubrey Davis include Bagels from Benny, Enormous Potato. About Eberhard C. Kennedy (Author) : Eberhard C. Kennedy is a published author. Published credits of Eberhard C. Kennedy include Two Centuries of Roman Poetry: Lucretius, Catullus, Virgil, Horace, Ovid, Martial and Juvenal.